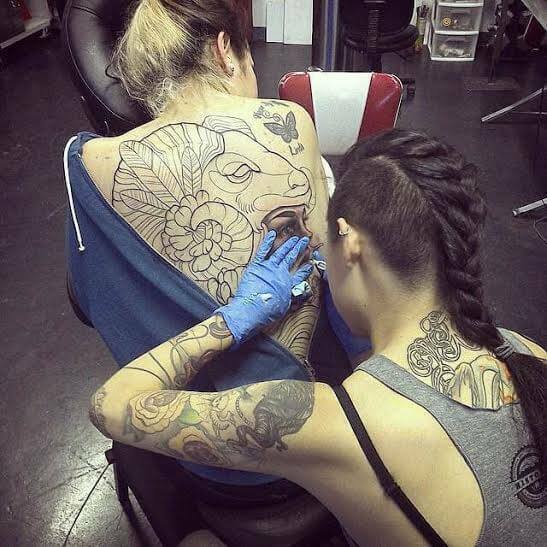 While admittedly new to the tattoo industry, Amy Jiao makes up for her lack of experience with pure talent. With some enthusiasm thrown in for good measure. Currently at Inkblot Studio in Ames, Iowa, the Rochester Institute of Technology graduate started her career with her mentor, Johnny Jinx, at Broken Clover Tattoo in Tucson, AZ. in 2012. The 26-year-old came to the U.S. when she was 11 and grew up in Troy, Michigan. But while she is no stranger to these Midwest winters, Jiao still likes to escape them when she can. “Right now I really enjoy doing guest spots at my old shop in warm and sunny Tucson during the winter months to escape the brutally cold and windy Iowa weather,” she said. But being new to the industry, she’s still exploring a variety of styles. Right now she’s interested in neo traditional work, leaning on the realism side with bold outlines, bright colors and a mix of traditional shapes and realistic shading. Besides getting out into nature and going to museums whenever she has time, Jiao finds inspiration through other artists. She said she follows a variety of artists on several platforms, including Instagram, Tumblr and DeviantArt, “including but not limited to tattoo artists, painters, illustrators and calligraphers.” Jiao believes seeing other artists’ daily lives and their inspirations are just as important as seeing the art they produce. One example of such an artist is Jeff Gogue. She said he showed her that what you can do with a tattoo machine is limitless. And she truly does seem to draw inspiration from whenever she can, which is why she really enjoys doing tattoo conventions. She said the crowd and the high energy motivate you to do the best work you can do. One of her favorite tattoos she’s had done is a jellyfish on her left forearm, by Josh Payne at a Washington, D.C. expo. She said it was the longest she’d sat for a tattoo, about six hours, but it was worth it. She learned a lot just from watching him work. All the learning she’s been doing is really starting to pay off. She said her favorite piece so far was one that covered the client’s whole back. It was the face of an Indian girl wearing a ram’s headdress and it took about 12 hours over four sessions. Though Jiao is a young woman in a field that used to be dominated by men, she said she doesn’t think it’s like that anymore.